Page 1 of 3, items 1 to 7 of 17. The NMVTIS Business Rules Working Group (NMVTIS BRWG) met in Santa Fe, New Mexico on April 16th and 17th. The working group met to continue to discuss the NMVTIS modernization plan, the development of the Performance Management Concept (PMC) pilot, and the Salvage and Junk Vehicle Best Practice. Overall, the working group had a very productive two days and made great strides on each topic on the agenda. 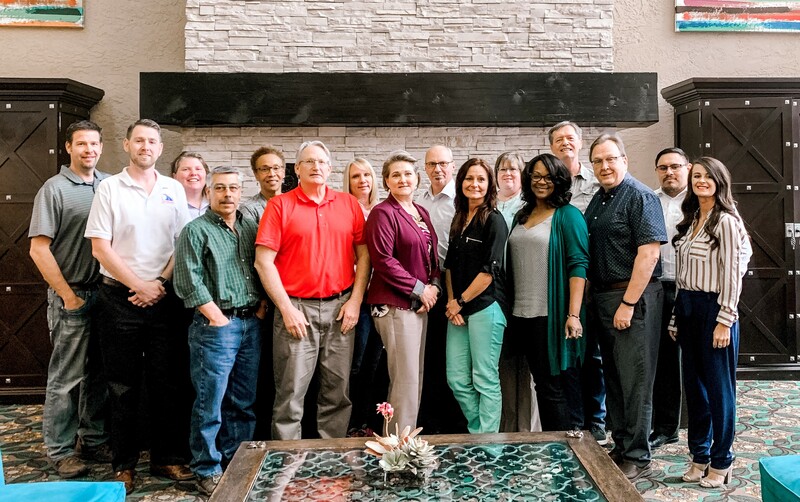 Sam Amaya, Director of Vehicle Systems for AAMVA, joined the working group to gather additional details for the business requirements for NMVTIS modernization, and the working group deliberated many questions and the benefits gained from improving the system. The working group further discussed the methodology and timing to roll out the PMC pilot. Additionally, they took feedback from the board and dialogue held at the AAMVA Workshop and Law Institute on the Salvage and Junk Vehicle Best Practice into consideration in order to position the document to be reviewed and approved by the board, then published. A date has not yet been determined for the next face-to-face meeting but the group intends to come together for two meetings in fiscal year 2019. 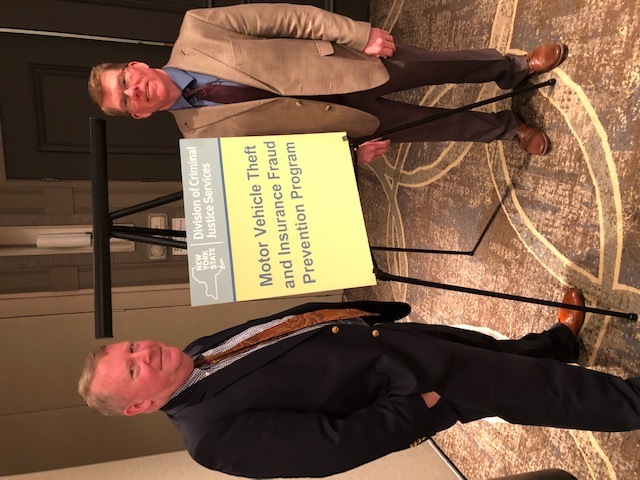 The New York Motor Vehicle Theft and Insurance Fraud Prevention Symposium was held on April 16th and 17th in Saratoga Springs, NY. This is an annual symposium focused on providing education and resources to enhance investigative efforts in combatting vehicle fraud and theft. On Tuesday April 16th, Owen McShane, Director of Investigations for the New York Department of Motor Vehicles, and Paul Steier, AAMVA Law Enforcement Program Manager, provided a presentation on the use of NMVTIS and the Law Enforcement Access Tool (LEAT). This presentation highlighted the value of NMVTIS LEAT when conducting vehicle crime investigations and provided information on program access. 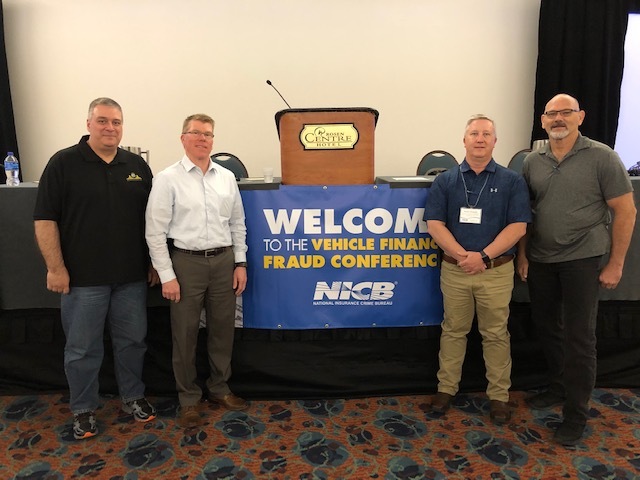 The National Insurance Crime Bureau (NICB) Vehicle Finance Fraud Conference was held in Orlando, FL on April 17th and 18th. The conference covered topics related to the detection and investigation of vehicle finance fraud. Vehicle finance and insurance fraud investigators, as well as law enforcement investigators, were in attendance. NMVTIS Law Enforcement Working Group members Chris McDonold, Director, Maryland Vehicle Theft Prevention Council, and Les Cravens, Director of Law Enforcement, Auto Data Direct, provided presentations during the conference. Paul Steier, AAMVA Law Enforcement Program Manager, also provided a presentation on NMVTIS and use of the NMVTIS Law Enforcement Access Tool. Also pictured is Rusty Russell, NICB Director of Vehicle Operations. 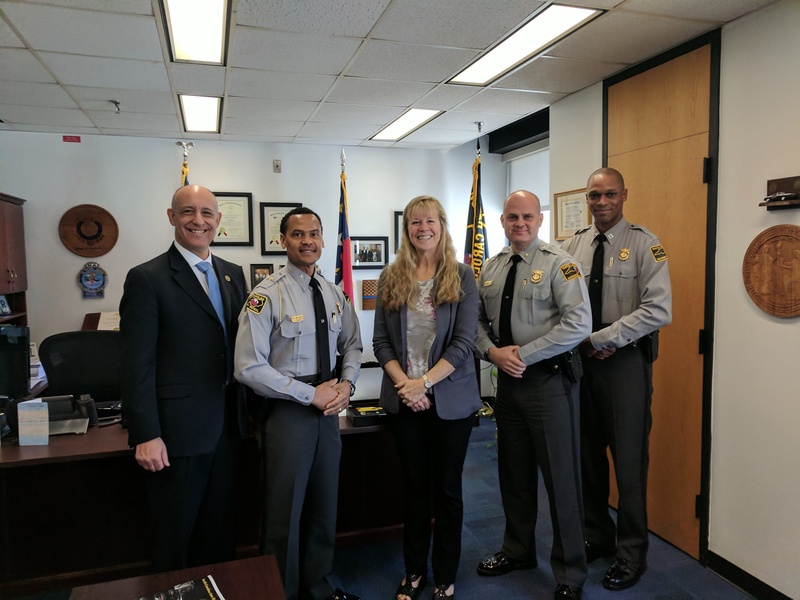 Patrice Aasmo, AAMVA Director of Member Support, Regions 1 & 2, and Brian Ursino, AAMVA Director of Law Enforcement, visited with North Carolina Highway Patrol (NCHP) Colonel Glenn McNeill and members of his staff on April 16, 2019, at NCHP headquarters in Raleigh, NC. The meeting served to strengthen an already strong AAMVA/NCHP relationship. 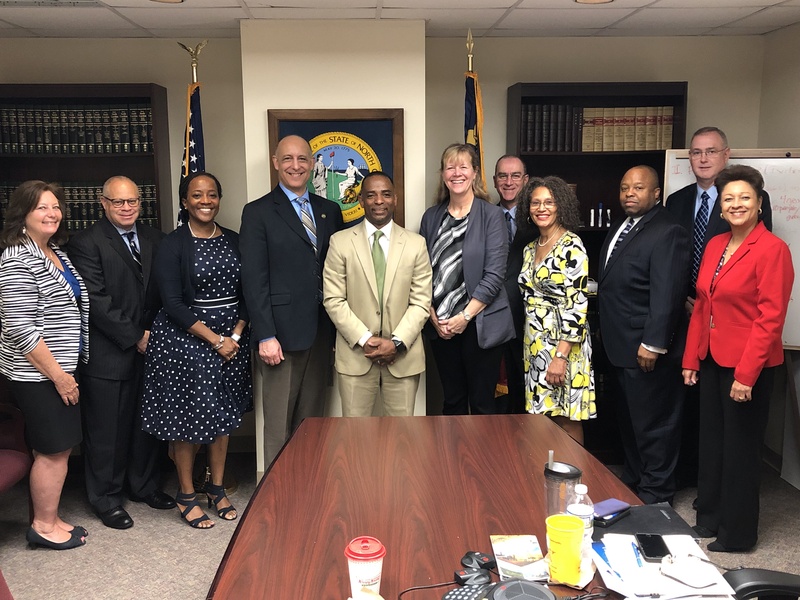 On April 17, 2019, Patrice and Brian spent the day visiting with Commissioner Torre Jessup and the NC DMV management team in their Raleigh headquarters, where the NC team learned more about their association, as well as AAMVA resources and benefits. They also shared the projects they are working on, including current and upcoming projects and opportunities. Before a jurisdiction issues a title or other ownership document or record, the SWI can provide information to help the jurisdiction determine whether the ownership documentation presented with the application are valid. The information supports jurisdictions' titling processes for both new and used vehicles. The Anti-Car Theft Act requires each jurisdiction to perform an instant title verification check before issuing a title to an applicant claiming to have purchased the vehicle from an individual or entity in another jurisdiction. The SWI VIN search feature can be used to satisfy this legal requirement. In addition, the NMVTIS best practice is that jurisdictions perform an inquiry before issuing a title or other ownership document or record, whether or not the applicant claims to have purchased the vehicle in another jurisdiction. NMVTIS has two third party transactions that involve updates between the central site and multiple states. Because the transactions involve multiple states and the central site, it is possible for a transaction to break down before it completes. Further activity against this title record is greatly restricted until the problem is resolved. This webinar provides instruction as to how to identify and resume suspended transactions. The intended audience for this webinar are NMVTIS Help Desk Personnel, Business Process Analyst and IT System Integrators. Note: This webinar is for AAMVA jurisdiction members only.